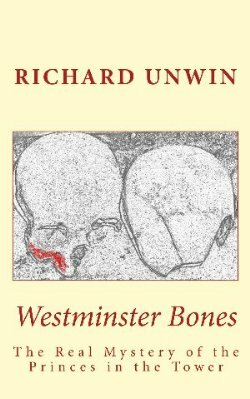 When dealing with the subject of King Richard III and what happened to the Princes in the Tower of London, the sons of Edward IV, the uncrowned and bastardised Edward V and Richard duke of York, there seems to be just two schools of thought: that Richard III murdered them, or that someone else did. This latter option is divided between Henry Tudor, the seventh of England, and Henry Stafford, duke of Buckingham. There is, however, another opinion: that one of the princes died a natural death while the other escaped to a place of safety. The suggestion of death by natural causes may not have the dramatic ring that murder does, but of all the possibilities that might emerge from what we know of the events of 1483, this one at least is as reasonable, if not more so, than many other hypotheses. Conventional stories of Richard III and the Princes in the Tower of London describe an abiding mystery. There is, so far as historical research can discover, no certain answer. On the face of it, this may be thought to have been the case at the time also. It seems that nobody then could get to the bottom of what had actually happened to the two princes either. Learned books that are based only on scholarly historical research are handicapped, to some extent, by the expression of ideas that can only be proved or often demonstrated likely as being true by reference to an actual record of some kind. As soon as speculation enters the work, then inevitably some credence is lost; yet often, reasoned speculation is the only way forward otherwise the whole work might become inchoate and flounder. Some writers succumb to temptation and take sides. The risk here is the possibility of misinterpretation of facts, especially where a historical circumstance seems at odds with the thrust of an argument and thus hypothesis is massaged to suit. We all of us form an opinion as to what we consider to be the likeliest run of events, especially when we have read extensively on the subject, but there are often grey areas that, were we in possession of the true facts as to what actually happened, might alter our hitherto certain perceptions absolutely. The story of Richard III, and the aftermath of his reign, certainly has more than enough high drama to sustain a good tale. When reading up on the subject we are struck by many ambiguities that cloud the events, ambiguities that must be overcome to progress our understanding of the story. The first one is the apparent change of Richard’s character from one who is completely and consistently loyal to his brother, Edward IV, to one who coverts the crown even to the extent of murdering his brother’s sons. Second only to this is the attitude of Elizabeth Woodville, Edward’s queen and mother to the princes supposedly murdered by Richard, who had bastardised them and proclaimed himself king. Though she makes a great public show of anguish and grief at what she allows people to think of as the murder of the princes, yet she encourages her daughter, Elizabeth of York, to set her cap at Richard when it is realised his wife is dying.Then, after the Battle of Bosworth, we find the victorious Henry Tudor, now king of England, beset at intervals by two “pretenders” to his throne, one claiming to be Edward earl of Warwick, the son and heir of George duke of Clarence, and the other the younger of the two princes, Richard duke of York. The first is Lambert Simnel and the second is Perkin Warbeck. The point here is that, though nobody at the time seems to have had any difficulty in believing Prince Edward was dead, there is doubt regarding the demise of Prince Richard. Was this due to “underground” knowledge? Moreover, if Prince Edward had died a natural death and his brother removed to a safe place, then this would account for Elizabeth Woodville’s and her daughter’s attitude to Richard III. Their grief for Edward’s natural death would be real, but they knew Richard III had not murdered either of the boys. Perhaps they remained silent due to the machinations of the Tudor faction, and they naturally would want to keep secret the idea that the younger boy was free. If they knew what really happened then it is a fair bet that there were others who knew as well. This would account for the readiness of the some in the aristocracy, after the Battle of Bosworth where Richard III was killed, to promote first Lambert Simnel and then, later, Perkin Warbeck. Whether or not they believed that these were who they said they were is uncertain. Lambert Simnel certainly was an impostor and some have postulated that he was merely there to pave the way for the real prince, Richard of York who would return once Henry VII had been removed. The readiness of many of the nobility to support them, both in England and on the continent, suggests they believed that the real Prince Richard was out there somewhere, and so it seems did Henry Tudor and for that matter his son, Henry VIII. One hundred and ten years or so later, towards the end of the reign of Elizabeth I, William Shakespeare would deliberately portray Richard III in a monstrous caricature, indicating that even at this remove in time, Elizabeth Tudor still felt threatened by the possibility that Plantagenet ancestors might still be around. Moreover, his sponsor in 1593 when the play was first produced was Ferdinando Stanley, Lord Strange, heir to Henry Stanley fourth earl of Derby. His ancestor was one who betrayed Richard III and helped Henry Tudor to the throne, yet Shakespeare, careful and pragmatic, would so over-blow his characterisation that he seems to be asking us “can you really believe this”? Perhaps he knew something too. It is suspected, though by no means certain, that Prince Edward had a disease of the jaw when he entered the Tower. Apart from the fact that he felt himself to be deprived of his kingship, he was certainly ill with a malady of some sort, as evidenced by the presence of a physician in the Tower, Dr. John Argentine; therefore he would not be much of a companion for his younger brother. We cannot be sure that the other prince was actually Richard of York and perhaps a substitute for him was introduced, both to secure the safety of the real prince and to provide companionship for the sick Edward. Another possibility is that the younger of the Princes in the Tower was smuggled out after his elder brother’s death, thus neither of the princes were in the tower, which is why king Richard III could not produce them when rumour of their deaths began to circulate. The story of their murder began as Lancastrian propaganda. With the threat of Henry Tudor, a man of dubious lineage bidding for the throne, the continued existence of a Plantagenet prince would be a possible future trump card. Henry Tudor planned to marry one of the daughters of Edward IV to establish some royal blood in the veins of his heirs; (he eventually did so marrying Elizabeth of York, eldest daughter of king Edward IV). To do this he would have to re-legitimise them and this meant re-legitimising their brothers, too. In this case, the Princes in the Tower would once again become the rightful heirs to the throne of England, confounding Henry’s own ambition. For his plan to work the princes had to die, but he needed to get hold of them first. Edward’s death from natural causes made his task easier, there afterwards being just one living prince. This is why prince Richard of York had to be taken away to safety where he would be a perpetual threat to the Tudors. If Elizabeth Woodville conspired in this, and the knowledge spread around a few in the aristocracy, it is entirely possible that others would find out too and this could account for Henry Tudor’s nervousness and the attitudes of those who came to promote the “pretenders”. Even when questioned later by her son-in-law, Henry Tudor, Elizabeth Woodville refused to admit that her sons were dead or even that they were missing. To ensure her silence she was confined to a nunnery for the rest of her life, cut off from the world. This accounts for why nobody questioned that prince Edward was dead, after all, the rumours that were spread by the Tudors was that both princes were murdered, so where did the idea come from that one of them escaped and that he was Richard of York? After all, when engaging in a conspiracy, wouldn’t an escaped king’s first heir be a better bet, unless it was certain he was dead? One thing is sure, the attitude of Henry VII and his heirs indicate doubt, in spite of their propaganda to the contrary. It remains a strong possibility that there was no murder, unless, of course, we count the eventual contrived trials and executions of Perkin Warbeck and Edward of Warwick; but that is another story. The story of King Richard is told in On Summer Seas, and continued in A Wilderness of Sea, which tells of the possible fate of the Princes in the Tower. Go the the home page for links to the book shop. 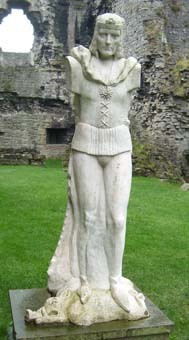 Statue of Richard III at Middleham Castle.